» What are the Best Ergonomic Office Chairs? For a professional who works long hours in an office environment, an ergonomic office chair is an incredibly valuable investment. Long hours of maintaining the same position take a heavy toll on the spine, particularly the lumbar region of the lower spine, and the muscles in the back, causing neck and hip pain as well. An ergonomic office chair corrects these problems by supporting you in several key ways. 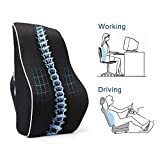 It promotes proper posture, enhances your comfort by allowing you to adjust your position, includes a headrest which can be used to support your neck and prevent neck pain. It also prevents back pain by keeping your back in the proper position and prevents you from exerting too much pressure on your hips with its cushioned seat. Buying an ergonomic office chair is an excellent investment for your future health, as it helps you avoid the strain that repetitive activities cause and reduces the risk of health problems that have the potential to be serious later in life. How Do I Choose an Ergonomic Office Chair? What Type of Chair is Best for Office Work? Musculoskeletal disorders are a significant and increasingly prevalent health problem in our society, costing a total of $50 billion per year in the United States. Employers pay a significant part of the expense in workers’ compensation claims, which indicates that ergonomic office chairs are a great investment for employers as well as for individuals. The benefits of ergonomic office chairs go far beyond preventing musculoskeletal disorders. Studies indicate that these chairs improve productivity, decrease absenteeism, improve employee retention, and improve job satisfaction and office morale. There are ergonomic office chairs available to fit any budget. Whether you’re willing to make a significant investment in the best quality merchandise or planning to buy a chair on a budget, you will be able to find a product to fit your needs. With such a diverse array of chairs available on the market, it can be challenging as a consumer to find the product that fits your needs the best. It’s important to take several factors into account, including what features you require for your particular needs, budget, how often the chair will be used, and any other considerations that are important to you. This chair has a great look and is made from a combination of mesh and leather designed for comfort and breathability. It's a great middle-of-the-road chair that offers a combination of comfort and cost. The mesh back and seat on this chair allow for breathability, that way you don't get an uncomfortable buildup of moisture or heat. That can be especially helpful on hot days when you might otherwise be left uncomfortable. For those who work in an office setting, that cooling benefit can also help you to avoid unsightly sweat stains on the back of your clothing. 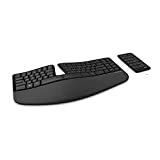 You'll also get the benefit of lumbar support built into the back which can really be helpful to keep your spine comfortable and your posture strong. One of the most important things to remember while working from a desk is to keep good posture as well as comfort, but it can be tough. Through adjusting the height and tilt of the chair, you can set yourself to the perfect comfort level whether you're using it all day or just sitting down for a few minutes to complete a task. The breathability and adjustability of this chair make it a lot easier to get comfortable in for those who have to spend longer hours at their desk. The combination of leather and mesh also allows the chair to keep you cool while still offering a professional look that is important for many. The extra back support also allows you to maintain good posture in an easier way, which is important to avoid back problems. While there is a lot of adjustability, the lumbar support in the back of the chair isn't able to adjust up or down. What that means is that taller users don't end up getting the support in the right place, which can ultimately make it uncomfortable for some people. The cushioning in the headrest and seat may also be more firm than expected, which doesn't suit everyone. If you prefer your seat on the firmer side, then it's a great option but otherwise you might want to look elsewhere. For taller customers looking for a chair that will be better suited to their needs, this Big and Tall Executive chair offers a higher weight limit and taller back than other options. When you need something luxuries and built for those with more stature, this is a great choice. With multiple padding layers and a nice mesh material, you'll find comfort and excellent breathability in this HON chair. You'll be able to keep cool because the mesh won't hold in the heat or moisture that other kinds of materials can. Leather-only chairs can get uncomfortable, sweaty and even hot during the warmer months, but you won't have to worry about that with this mesh chair. Unlike other options, you can also make a lot of adjustments with this chair to gain the perfect level of comfort for nearly any height. You'll be able to adjust the height of the chair as well as the arms, the tilt of the recline and even the lower back support. That's highly beneficial because lower back support can get uncomfortable if you can't adjust it to your height. The durable wheels on this chair also allow you to move around and get in or out of your desk more easily. The best aspect of this chair has to be the high level of adjustability. People of varying heights can easily get uncomfortable when a chair is too short or when the arm rests are too low. Lower back support can also become a problem if it isn't in the right place, so the ability to move it to fit your needs is exceptional. Another great aspect of this chair is that it's backed by a 5 year warranty. That's quite a long warranty period and ensures that the manufacturer truly stands behind their product. 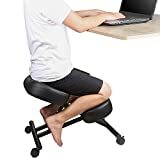 While it's listed as being a chair for taller users, there have been some problems that the demographic has experienced. For example, some have found that the seat of the chair can sink even if the user is well below the weight limit. This can result in some frustration for those expecting a chair built for their bodies. In a few other cases, customers feel like they are sliding out of the chair, which can cause for frequent adjusting. This chair has a little bit of a different design than the others, as its light gray and made with bonded leather. It's a great, classy office chair with a high-class design at an acceptable cost. One of the most important aspects of this chair is that it includes specialized lumbar support technology that uses air to allow the cushioning to move and flex along with your body so that you can stay comfortable and supported. Spinal health is incredibly important for those who spend long hours sitting so it's wise to find a chair that can offer assistance for your back. You'll also be able to adjust things like height, tilt and even arm rest positioning so that you can set them to your needs. Because this chair is also made from bonded leather, it will be easier to clean and maintain than other options. You'll also get a fantastic 1-year warranty just in case any problems should occur during normal use. With the great design, comfortable cushioning and adjustability, you'll be unlikely to go wrong with this chair. Deep, ergo layered body pillows offer the body a serene and tranquil seating experience. 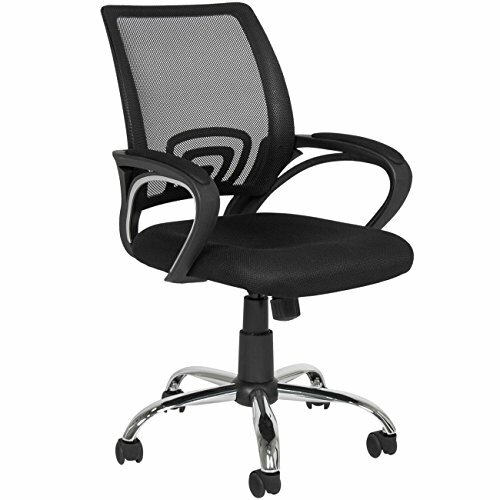 Seat Back Height-25"
Lower back support is highly important for those who spend the majority of their day at a desk. In most cases, it's going to be worthwhile to make sure your back is supported comfortably. The adjustments you can make in this chair are also great, especially the arm rest positioning. The standard placements for arm rests may not be the most universally comfortable, so it's excellent that these can be moved to suit your needs. Color is a highly subjective thing, but it may be important to note that a gray chair might be more likely to show wear or stains more than a black one. The bonded leather covering can also get uncomfortable in the warmer months because it doesn't breathe well. That could result in heat and moisture building up against your back. It's also wise to make sure you test out this chair and get a good feel for whether or not the lumbar support is comfortable for you, because not all customers are fond of it. You don't have to give up comfort for a lower cost, and this chair can prove it. With its padded seat and breathable material, you'll be able to get the support and comfort that you need while still sticking to a budget. It has a simple design, but still has a lot to offer! While it may not have the extreme levels of adjustability as more expensive options, this chair is still capable of offering a lot in the way of support and comfort. It's simple, but capable. The durability will allow you to get the most for your money. You'll also get a highly padded seat to ensure that you're comfortable for those long hours you might have to spend at your desk. Because it's made with a sturdy metal base, you won't have to worry about it breaking under you. The arm rests are also padded so you have a comfortable space to rest your arms rather than hard plastic. The mesh back also allows air to get in and out, that way you won't have to deal with heat or sweat building up. 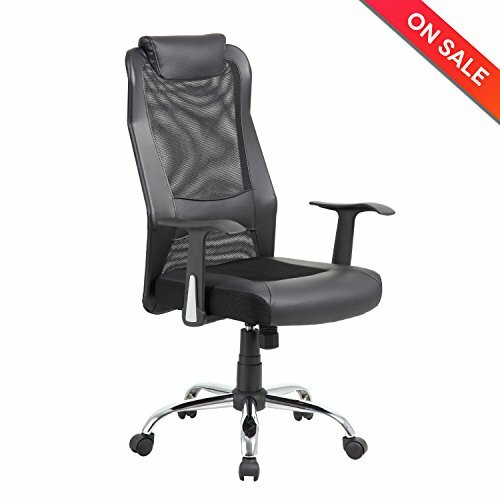 Like many office chairs, it swivels and rolls, so you can move around easily. Many people who are looking for an office chair, but don't have the money to put into a top notch model worry about the kind of comfort they'll be able to get. With this chair, you won't have to worry about that. It's well-padded and leaves customer raving about the comfort because it's often better than they expect. It's also made to be sturdy, lowering the concern that you might have to purchase another chair within a shorter period of use and ultimately still have to spend more. There have been some cases where customers have received the chair in damaged condition, or had breakages occur not long into ownership. This can happen even with pricier chairs, but it is something to be aware of. It can also be difficult to put together so if you can it might be wise to find an online resource to guide you through the process and therefore avoid frustration. If you're willing to spare no expense for the very best that money can buy, this chair is well worth a look. It offers high-quality materials and customizable support to ensure you the most comfortable fit. It's made with graphite and mesh that allow for durability and the ability to breathe. If you spend a lot of time at your desk, then you'll want a chair that is good for your body and comfort level. This chair uses a specially designed seat that is made to give you support across 8 different zones to ensure your body is aligned correctly. You'll also be able to adjust the cushions used to support your lumbar and sacrum areas. Each person is different, and therefore the needs of their bodies differ as well. The support that works for one person may feel uncomfortable to another. You'll also be able to adjust the arms to suit your needs. One of the most fantastic aspects on this chair is the customer service you'll get from owning it. With a stunning 12-year warranty, you'll be able to ensure that you have the chair or a replacement for it for at least that long. While its iconic form has remained largely unchanged, the Aeron Chair has been remastered from the casters up. With the help of Don Chadwick, the chair's original co-designer, Herman Miller has updated Aeron to incorporate more than 20 years of research on the science of sitting, as well as advancements in materials, manufacturing, and technology. Across Aeron's 8Z Pellicle elastomeric suspension seat and backrest, eight latitudinal zones of varying tension envelop you as you sit, delivering greater comfort and ergonomic support. The new 8Z Pellicle also allows body heat to pass through to help maintain an even and comfortable skin temperature. Sitting in one position reduces the natural pumping action of the muscles that deliver nutrients to the spine. As you sit in Aeron, however, the tilt allows the chair to move seamlessly with your body, so shifting between forward and reclining postures is smooth and balanced throughout the entire range of recline. The high-quality materials ensure that you'll get a lot of durability from this chair. It doesn't come at a cheap cost, and therefore it isn't made with cheap materials. Due to the customization, you'll also be able to get a lot of support that can keep your body in shape. That means you'll get a lot of comfort, as your body will be positioned as it needs to be rather than keeping you in a poor posture that can cause back pain and even damage after long periods of time. The cost of this chair isn't to be taken lightly. It's a very expensive item which means it's deserving of a lot of research prior to purchase. It's also important to keep in mind that some customers who have tried out this chair found it only mildly more comfortable than chairs at a fraction of the cost. This is all the more reason to shop thoroughly to make sure you get exactly what you pay for. The lumbar region is the medical term for the lower spine, below the rib cage. Lumbar support is vital because most of us tend to slouch forward when we maintain a sitting position for an extended period. This can be unhealthy, because by we unnecessarily push our lower backs out and into the chair which we are sitting on, exerting too much pressure and straining the structures in the lower back. A good ergonomic office chair corrects this problem by supporting the lower back. When the curvature of the office chair aligns properly with the curvature of the lower back, it is kept in its natural position, and we will not end up pushing our backs into the chair and exerting unnecessary pressure. When trying out an office chair, a good way to assess the quality of the lumbar support is by sitting in the chair and seeing if the chair is flush against the small of your back. Many chairs have adjustable backs, so you can modify the settings to align with your personal body shape. Your ears, shoulders, and hips should be kept in their natural alignment, all parallel to each other. If this isn’t the case, it suggests that you are sitting in an unnatural slouch due to insufficient lumbar support. Most ergonomic office chairs offer features that improve lumbar support. 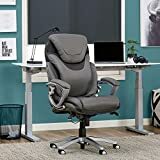 For instance, the Herman Miller C Size Aeron Chair, our recommendation for the best high-end ergonomic office chair, has a system called Posture Fit SL. With individual pads supporting the sacrum (the bone at the base of the spine) and the lumbar region, the spine maintains its natural S-shaped curve. The Serta Works Executive Office Chair, our recommendation for the most comfortable ergonomic office chair, comes with a contoured lumbar area and high-quality body pillows. With this chair, you can take advantage of the adjustable features to find the lumbar support that works the best for you. If you opt to purchase a budget-friendly model, a cushion can serve as a great lumbar support feature. You can purchase an inflatable cushion, which is easily adjusted to increase or decrease the support. These cushions have the advantage of being both versatile and easily transported from the home to the office. The material that is used for cushioning is too important a consideration to overlook. Any material like wood or vinyl that does not yield to pressure will end up exerting pressure on the person who sits on it. Ideally, it should be highly breathable. You will probably spend long hours of the day sitting in this chair, and material that allows for heat accumulation is likely to make you uncomfortable. One of the advantages of a mesh chair is its breathability. A mesh chair doesn’t necessarily have to be just a thin layer. 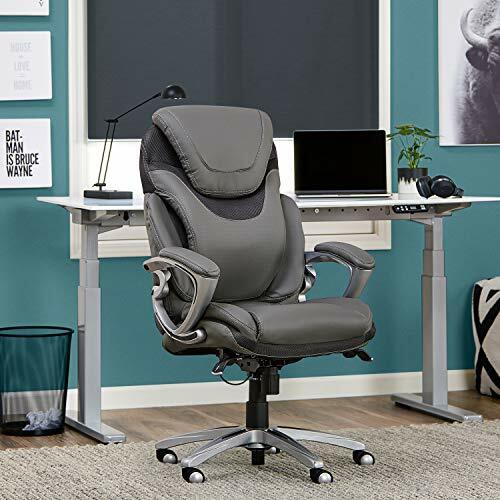 For example, the HON Big and Tall Executive Chair, our recommendation for the best ergonomic office chair for tall people, has a mesh back and a sandwich-mesh cushion, allowing the user to have multiple layers of padding while still preventing heat from accumulating. Seat height is the first consideration. An office chair can be used with desks of varying heights, and it’s important that the height of the chair corresponds properly with the height of the desk. A seat height between 16 and 21 inches off the floor is what most people require. Very tall people may require something a little higher. It’s ideal to have your feet flat on the floor, your thighs horizontal, and arms approximately at the same level as the height of the desk. Try adjusting the settings to find a height that works for you. If you can’t easily achieve this, it may be because your desk is too high or too low. The next consideration is seat tilt. This should be adjusted in a way that allows your thighs to be horizontal. You should leave between two and four inches of space between your knees and the edge of your seat. For most people, 17-20 inches is a good seat depth. 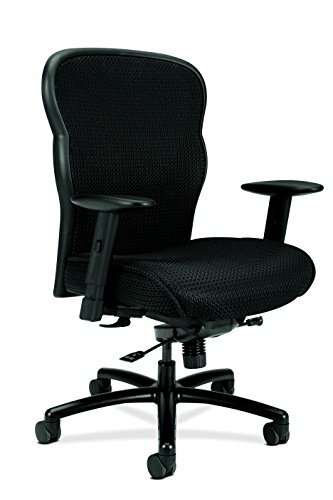 As mentioned earlier, lumbar support is crucial, and adjustability enables you to customize your chair to fit your unique needs. The chair should be flush with the small of your back. An adjustable lumbar support will help you to mold the chair to fit your spine. The backrest of the chair should support you in a way that accommodates the natural curvature of the spine, the whole spine, not just the lumbar region. The angle at which it intersects with the seat should be adjustable. Some chairs include a locking mechanism to prevent the back from moving too much if you lean back. Armrests should be adjustable to enable you to place your elbows and lower arms on them comfortably while typing. Ideally, your forearm should not be on the armrest. Armrests should be high enough that there is no tension on your shoulders when you place your arms on them. Swiveling is important to enable you to move around and access objects on your desk, or turn around to face away from your desk. A chair that doesn’t swivel leaves the user inclined to reach too far for items on the desk, thus causing unnecessary strain. When purchasing an ergonomic office chair, check to see that all these adjustable features are in place and work well for you. If the chair is going to be used by more than one person or in more than one location, it’s crucial that it can be modified to fit the needs of everyone who plans to use it. Ideal dimensions for an ergonomic office chair vary from one user to the next, and what follows should be taken as a set of guidelines rather than a set of hard and fast rules. As mentioned earlier, seat height should be about 16 to 21 inches from the floor, adjustable depending on the person using the chair. Flexibility is key. The seat should be wide enough to support the user comfortably, with a bit of extra space. 17 to 20 inches is standard. The depth of the seat should be around 19 inches. What’s ideal will vary from user to user. There should be enough room for your legs on the chair when you lean back against the backrest. Backrests should be between 12 and 19 inches wide. Here, we review the two types of upholstery commonly used in ergonomic office chairs, namely mesh and leather, and discuss the advantages of each. Mesh office chairs are great for their breathability. Whereas other fabrics tend to trap heat, mesh chairs allow it to escape through their network of pores. Over a short-term heat retention might not seem like a very significant consideration, particularly in a climate-controlled office environment, but over a long-term heat retention is a significant problem that most users want to avoid. Another advantage is that mesh chairs do not trap liquids such as sweat. This makes them easy to keep clean, which is very important in an office environment, where cleanliness helps to create an atmosphere of professionalism. Mesh chairs are also highly durable. Although the fabric looks thin and lightweight, the fibers are tightly woven and do not break down easily. 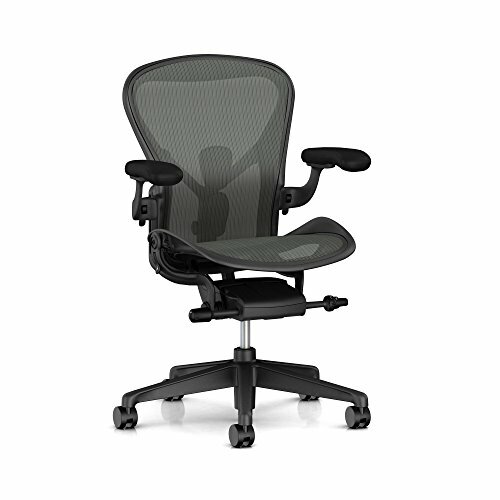 This makes a mesh office chair a great investment for the long term. Leather office chairs, on the other hand, are often very beautiful and stylish pieces of furniture made from high-quality material. They are very comfortable to sit on and provide an elegant accent to an office. Leather office chairs tend to be accommodating and yielding, and users seldom find that they are too rigid or stiff. They are smooth and not abrasive to skin or clothing. 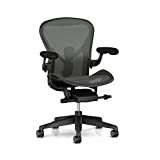 This can be a huge plus for individuals with sensitive skin who find mesh office chairs to be uncomfortably rough. In an environment such as a warehouse or an industrial setting, where airborne matter such as sawdust tends to be ubiquitous, leather chairs are a great alternative to mesh, as mesh chairs tend to trap this material in their pores, making them difficult to clean effectively. Leather chairs are also spill-proof. If you spill beverages or other liquids on them, you can wipe them with a rag. The health benefits of using an ergonomic office chair are many and well documented, and an article like this can only scratch the surface. Here we summarize some of the most important health benefits. Maintaining a proper posture is a key health benefit of an ergonomic office chair. When sitting on a traditional chair, such as a wooden chair without any support features, we tend to slouch forward and put too much pressure on our lumbar region and the sacrum. This can cause serious health problems such as sciatica. An ergonomic office chair reduces this by helping the back maintain its natural inward curvature. Ergonomic office chairs also reduce the risk of neck pain. Having a headrest is key as it reduces pressure on the neck. Also, an ergonomic office chair reduces pressure on your hips. This is a huge improvement over earlier models. Ergonomic office furniture can have a positive effect on office productivity. Employees are most productive when they are engaged and comfortable at work, and a distraction like back pain has an adverse effect. Also, comfortable office furniture helps to reduce absenteeism and improves employee retention, which saves money in the long run, as it reduces training costs. By reducing back pain and neck pain and the repetitive strain associated with traditional chairs, an investment in ergonomic office chairs can create a happier and more positive work environment. What sort of environment will the chair be used in? If the environment is dusty or dirty, such as an industrial setting, it might be wise to purchase a leather chair rather than a mesh model, as it is easier to remove the fine particulate matter from these chairs. If the environment is hot, or if the user will be spending long hours sitting in the chair, mesh chairs are a good choice to minimize heat retention. What is the body shape of the person purchasing the chair? Very tall individuals may find a traditional ergonomic office chair doesn’t offer them enough space and might want to invest in a chair specifically designed for them. Some chairs have a weight limit as well. What is your budget? There is such a diverse array of chairs available that it’s possible to fit any budget. From very affordable economy models for under $50 to high-end designs that cost as much as $1000 and offer great features, to everything in between. There’s a chair available to suit your needs. How often will the chair be used? Some professionals work long hours in the office, while others spend most of their time visiting work sites and only work in the office briefly from time to time. Those who spend more time in the office might want to consider investing more money in a higher quality chair. An ergonomic office chair is a chair with features that help promote musculoskeletal health and reduce pain in the back, neck, and hips, usually via adjustable features. An ergonomic office chair will often have features such as seat depth adjustment, backrest height adjustment, swivel base, back angle adjustment, back tilt tension adjustment, arm support adjustment, quality casters, a sturdy wheel base, lumbar support, and headrest adjustments. It depends on a number of factors. You definitely want to purchase an ergonomic chair, but which one you buy depends on how often it will be used, the environment it will be used in, and the preferences of the individual who will be using it. Now is a great time to shop for an ergonomic office chair. There are so many great products available, and whatever unique requirements you may have, there is surely a chair available that will satisfy them. The benefits of using these chairs are hard to overstate. With our lifestyles becoming increasingly sedentary, both at and away from the office, musculoskeletal disorders are becoming a significant health problem in our society, as well as a costly one. Ergonomic office chairs are a key way to combat this. Along with the improved health outcomes they provide, they increase office productivity and an accompanying increase in office morale and job satisfaction. It’s one of the most worthwhile investments you can make and is sure to provide comfort and satisfaction for years to come.